Byron Leslie Dorgan (born May 14, 1942) is an American author, businessman, attorney and former United States Senator and United States Congressman from North Dakota and currently serves as a senior policy advisor for the Washington, DC law firm Arent Fox LLP. He served 12 years in the U.S. House and 18 years in the Senate. He was a member of the Senate Democratic leadership for 16 years, first as Assistant Democratic Floor Leader and then as Chairman of the Democratic Policy Committee and Chairman of the Committee on Indian Affairs. In 2010, Dorgan announced that he would not seek re-election in the 2010 North Dakota senate election. In addition to his work at Arent Fox, Dorgan serves as a Senior Fellow at the Bipartisan Policy Center, where he focuses on energy policy issues as Co-Chair of BPC's Energy Project. He is an Adjunct Visiting Professor at Georgetown University, and serves on several boards of directors, including the Board of Governors of Argonne National Laboratory, and on the National Advisory Board of the Center for Arms Control and Non-Proliferation. Dorgan is also a New York Times best-selling author of four books, including two on economic and political issues and two novels described as eco-thrillers. Dorgan was born in Dickinson, North Dakota, the son of Dorothy and Emmett Patrick Dorgan, and was raised in Regent, North Dakota. His father's family was of Irish and Swedish ancestry, while his mother's was German and Norwegian. He graduated from Regent High School and earned a Bachelor of Science from the University of North Dakota and a Master of Business Administration from the University of Denver. Dorgan worked for the Martin-Marietta Corporation in the aerospace industry. Dorgan's public service career began at age 26, when he was appointed North Dakota State Tax Commissioner to a fill a vacancy opened upon the death of the incumbent tax commissioner. He was the youngest constitutional officer in North Dakota's history. He was re-elected to that office by large margins in 1972 and 1976, and was chosen one of "Ten Outstanding State Officials" in the United States by the Washington Monthly magazine. His future Senate colleague Kent Conrad worked in the same office before succeeding Dorgan at this post. Dorgan ran unsuccessfully for a seat in Congress in 1974. He was elected to the United States House of Representatives in his second bid in 1980. He was a member from 1981 until 1992, being re-elected five times. In 1992, the Democratic incumbent, Kent Conrad opted not to run for re-election because of a campaign promise. Dorgan won the election for the seat. However, that September the state's other senator, Quentin Burdick, died and Conrad ran for the seat in the special election. Conrad took the new seat in 1992 and Dorgan assumed Conrad's old seat a few weeks early. Dorgan was re-elected in 1998 and 2004. Conrad later was elected for a full term from North Dakota's other Senate seat. When Dorgan was chairman of the Democratic Policy Committee, he was one of the most powerful Democrats in the Senate. He was considered "something of a liberal hero." In the later years of his Senate career, he had been increasingly sought by the national media for comment on political issues. He was a strong opponent of continuing the U.S. embargo toward Cuba. He was instrumental in passing legislation to remove the embargo as it applied to the sale of food and medicine to Cuba. He introduced, with varying levels of success, several amendments to end the U.S. prohibition on travel to Cuba, and to terminate funds for anti-Castro broadcasting. Dorgan has also opposed most bills "liberalizing" trade policies between the United States and other countries, maintaining that most trade agreements resulted in higher trade deficits and shipping U.S. jobs overseas. He has a mixed record on tort reform issues, voting against the Private Securities Litigation Reform Act and the Class Action Fairness Act, but voting in favor of the vetoed Common Sense Product Liability and Legal Reform Act and the Protection of Lawful Commerce in Arms Act. Dorgan was Chairman of the Senate Energy and Water Appropriations Subcommittee and was also senior member of the Senate Energy Committee. He was an early supporter of renewable energy, sponsoring measures on the production tax credit for wind energy and creating a Renewable Fuels Standard (RFS) mandate to help build a renewable fuels industry. He also persuaded the U.S. Geological Survey to conduct and release the first official estimate of recoverable oil in the Bakken Formation in North Dakota. That estimate concluded that there was up to 4.3 billion barrels of recoverable oil from the shale deposits in North Dakota. Dorgan was Chairman of the Aviation Subcommittee of the Senate Commerce Committee and worked extensively on aviation issues. He has served as Co-Chairman of the Eno Center for Transportation project exploring ways to reorganize the Air Traffic Control function at the Federal Aviation Administration (FAA) in order to accelerate the movement to the next generation air traffic control system using GPS as a replacement for ground-based radar. As a member of the Senate Appropriations Committee, Dorgan earmarked substantial funds to create a Red River Valley Research Corridor to bring new high-tech jobs to that region. The Research Corridor was anchored by North Dakota State University and the University of North Dakota, which became magnets for new economic opportunities and new jobs in materials science, micro and nano-technology research, unmanned aviation vehicle research, among others. As early as 1994, Dorgan was sounding the warning about the speculation in unregulated financial derivatives, which would later be a central issue in the subprime mortgage crisis and subsequent 2007–2012 global financial crisis:, by U.S. banks on their proprietary accounts. He wrote the cover story for the Washington Monthly magazine titled "Very Risky Business" warning of the danger to the economy of the wagers that large financial institutions were making by trading in unlimited derivatives. In 1999, Dorgan voiced continuing concern over lack of regulation of derivatives. We are moving towards greater risk. We must do something to address the regulation of hedge funds and especially derivatives in this country, $33 trillion, a substantial amount of it held by the 25 largest banks in this country, a substantial amount being traded in proprietary accounts of those banks. That kind of risk overhanging the financial institutions of this country one day, with a thud, will wake everyone up. 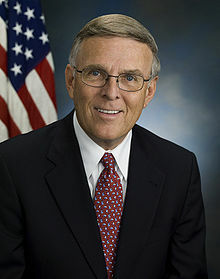 Senator Dorgan was one of only eight members of the Senate to vote against the repeal of key provisions of the Glass-Steagall Act (contained in the Gramm–Leach–Bliley Act) in 1999. During debate on that 1999 legislation, in a speech on the Senate floor, he said that, "it will in my judgement raise the likelihood of future massive taxpayer bailouts" (cited in John Lanacaster, Whoops, London, 2010, p. 161). On September 26, 2008, against a backdrop of growing economic turmoil caused by the Credit Crunch, David Leonhardt of The New York Times singled out a quotation made by Dorgan in 1999 during the US Senate's repeal of the Glass–Steagall Act. "I think we will look back in 10 years' time and say we should not have done this, but we did because we forgot the lessons of the past, and that that which is true in the 1930s is true in 2010." On January 23, 2008, Dorgan was one of the first politicians to speak of the oncoming economic downturn in a speech to the Senate given in response to then-President Bush's economic stimulus package. In 2007, Dorgan was a major supporter of net neutrality legislation in the Senate, seeing it as essential to keeping the Internet open and democratic. In 2007, he was a major opponent of the McCain-Kennedy Comprehensive Immigration Reform Act of 2007 (S. 1639) saying that the legislation's guest worker provision would continue the downward push of illegal aliens on the wages of American workers. In 2009, he voted along with all 39 voting Republican senators and 12 Democrats against an amendment to the Helping Families Save Their Homes Act of 2009. Three times, Dorgan introduced a bill to form a new committee modeled after the 1940s Truman Committee to oversee Government waste, fraud, and corruption in the awarding of government contracts. In 2009, Dorgan voted to approve the $838 billion stimulus package. The Senate voted 61-37 to pass this legislation. In 2009, Dorgan sided with fellow Democrats to make funds available to modify or build facilities to allow Guantanamo detainees to be brought to the United States. This was a reversal from his previous vote to not allow federal funds to be used to transfer or incarcerate Guantanamo inmates. Although Dorgan had indicated in early 2008 he would seek a fourth term in the Senate, on January 5, 2010, he issued a statement announcing he would not run for re-election. In it, he insisted that the "... decision [was] not a reflection of any dissatisfaction with my work in the Senate, nor [was] it connected to a potential election contest [in the fall of 2010] (frankly, I believe if I were to run for another term I would be reelected)." He gave his Senate farewell speech on December 9, 2010. Dorgan is briefly featured in Michael Moore's documentary Fahrenheit 9/11, in which he discusses the aftermath of the September 11, 2001 attacks. He was not being interviewed by Moore. Following his departure from the Senate, Dorgan announced the creation of a non-profit organization to help Native American youth living on Indian Reservations. He donated $1 million of unused campaign funds to create the Center for Native American Youth (CNAY), which is housed as a separate program at the Aspen Institute. The Center works on teen suicide prevention, providing educational opportunities, and additional issues with Indian youth in the United States. CNAY sponsors a Champions of Change program that recognizes outstanding Native American youth and develops mentors for other youth. Dorgan serves as the unpaid Chairman of the Board of CNAY. Dorgan is married to the former Kimberly Olson, who was formerly an Executive Vice President and lobbyist for The American Council of Life Insurers. Together they have two children, Brendon and Haley. From his first marriage, Dorgan has a son Scott who has two children, Mason and Madison, and he also had a daughter Shelly, who is deceased. In November 2005, Dorgan was accused of receiving campaign contributions from people who worked for companies connected to lobbyist Jack Abramoff. Because Dorgan was the top Democrat on the committee investigating corruption charges against Abramoff, questions were raised about a possible conflict of interest. In a statement released on November 28, 2005, Dorgan responded by asserting that he has never personally met Jack Abramoff, nor has he ever received money from Abramoff. Dorgan did acknowledge receiving money from Abramoff's clients, but the donations began prior to their involvement with Abramoff. Dorgan's statement went on to say that he has supported the programs that benefited Abramoff's clients years prior to the contribution. On December 13, 2005 Dorgan announced that he was returning all donations from Abramoff's clients as a precaution to avoid any impropriety as the contributions may have been directed or requested by Abramoff. ^ "On Politics: Covering the US Congress, Governors, and the 2010 Election - USATODAY.com". Blogs.usatoday.com. Archived from the original on January 18, 2010. Retrieved August 29, 2010. ^ "Faculty". explore.georgetown.edu. Retrieved October 23, 2018. ^ "Three new members join Argonne Board of Governors". University of Chicago News. Retrieved October 23, 2018. ^ "Board". Center for Arms Control and Non-Proliferation. Center for Arms Control and Non_Proliferation. Retrieved September 22, 2016. ^ "1". freepages.genealogy.rootsweb.com. Retrieved October 23, 2018. ^ "Senators Press To Lift Cuba Food Embargo". Washington Post. ISSN 0190-8286. Retrieved October 23, 2018. ^ "ASA Applauds Senate Amendment for 8 Billion Gallon Renewable Fuels Standard - American Soybean Association". American Soybean Association. May 25, 2005. Retrieved October 23, 2018. ^ "Thune/Dorgan Measure Promotes Wind Energy". U.S. Senator John Thune. Retrieved October 23, 2018. ^ "News". www.usgs.gov. Retrieved October 23, 2018. ^ "Frontline, Money, Power & Wall Street, Part One (transcript)". Retrieved April 28, 2012. ^ "Biography | Byron L. Dorgan — United States Senator, North Dakota". Dorgan.senate.gov. Archived from the original on September 13, 2007. Retrieved August 29, 2010. ^ Switzerland. "ICTSD • US Senate Passes Stimulus Bill with Tempered 'Buy American' Requirements". International Centre for Trade and Sustainable Development. Retrieved August 29, 2010. ^ "NewsBack.aspx". North Dakota Republican Party. Archived from the original on February 27, 2010. Retrieved August 29, 2010. ^ "Senator Dorgan of North Dakota to Retire". Retrieved October 23, 2018. ^ "The Center for Native American Youth Celebrates One Year - The Aspen Institute". The Aspen Institute. March 8, 2012. Retrieved October 23, 2018. ^ "The Center for Native American Youth". www.cnay.org. Retrieved October 23, 2018. ^ "Champions for Change | Center for Native American Youth". www.cnay.org. Retrieved October 23, 2018. ^ "Election Statistics". Office of the Clerk of the House of Representatives. Archived from the original on July 25, 2007. Retrieved August 8, 2007. Byron Dorgan In The Halls of Congress Documentary produced by Prairie Public Television. A Conversation With Senator Byron Dorgan Interview with Senator Dorgan by Prairie Public Television shortly before his retirement. Wikimedia Commons has media related to Byron Dorgan.